Figure 1: Table of CO2 Generation By Fuel For 1 Million BTUs of Heat. My year-round cabin in northern Minnesota needs a furnace, and a furnace needs fuel. My fuel options are fairly limited – fuel oil, liquid natural gas, or propane. I ended up choosing propane because the local propane gas supplier has a reputation for being reliable. 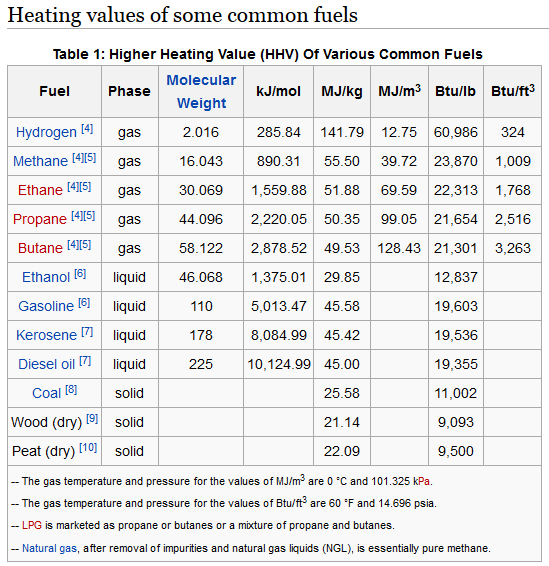 While researching the fuels, I became curious about the amount of CO2 released into the atmosphere by the different fuel options for given amount of heat. I do plan on incorporating some solar panels next year for heating water. Right now, I am trying to get cabin construction complete before winter arrives. For this post, I stayed with US customary units. This allowed me to compare some of my results with those posted by the US government, and the agreement was excellent. The spreadsheet evaluates Equation 1, which computes the mass of CO2 produced when 1 million BTUs of energy are generated using each fuel. EReference is the amount of energy used as the basis of comparison. For this post, I am using 1 million BTUs, which is the same as used by the US Department of Energy. MWCO2 the molecular weight of CO2 (44 gm/mole). ΔHFuel is combustion enthalpy of the fuel (i.e. heat generation by combustion per mole of fuel). I list a table of these values in Appendix A.
nCO2 is number of moles of CO2 generated per mole of fuel. With the exception of coal, all the CO2 calculations are a straight forward application of Equation 1. Coal is the exception because it is not pure carbon. I have written a post about this topic. 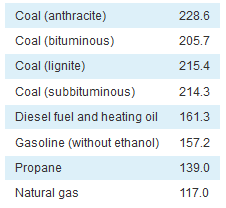 Some grades of anthracite coal actually generate more heat per pound than if they were 100% carbon. To deal with this fact, I computed an effective specific heat of combustion using the measured specific heat of combustion for coal. I assume the coal is 100% carbon but that the carbon generates more heat than real carbon. For my analysis, I used an anthracite coal with a heat output of 14,820 BTU/lb. We can convert that to an effective molar heat of combustion as shown in Figure 2. This is the value I used in the table shown in Figure 1. Figure 2: Effective Carbon Heat of Combustion. If coal was pure carbon, the heat output would have been 14,116 BTU/lb, which you can calculate as shown in Figure 3. Figure 3: BTU per Pound From Carbon. I will be looking for ways to reduce my carbon footprint going forward. I have plans for solar water heating and solar electrical generation. It is a bit tough when you are at the latitude of northern Minnesota, but the Germans have an excellent solar power infrastructure, and they are at an even higher latitude, e.g. Stuttgart is at 48.7° and my cabin is at 47.7°. If they can do it, so can I.
I should make a comment about burning hydrogen for fuel, which generates no CO2 because there is no carbon involved at all. While this analysis makes the burning of hydrogen look attractive, unfortunately most hydrogen is produced commercially through steam reforming, which results in the generation of a large amount of CO2. Figure 4 is the source of my fuel information. Figure 5 shows a comparable table of values that was prepared by the US DoE. This entry was posted in Construction, General Science. Bookmark the permalink.